If you are considering wood garage kits it is best if you know exactly what is included with any prefab garage kit and what other materials you will need to purchase on your own to complete your prefab garage project. We have surveyed a number of prefab garage wood kit suppliers and compiled an average cross section of a typical kit. We will outline what is included in the average prefab garage kit below, so that you will have a rough idea of what apples to apples means, when comparing prices. Your best place to start is a visit to your local lumber yard. Most yards are authorized dealers of pre-cut wood prefab garage kits from the various pre-fabbers and suppliers in North America. If they have some in-stock in the size and style you want, they may be willing to make you a great deal on it. ♦ Various sizes of white-pine trim for fascia's, gable ends, etc. *Editor's Note: Your editor's do not recommend the use of extension springs with overhead doors. Pay the small additional cost and upgrade to the self-contained torsion spring. They are safer! 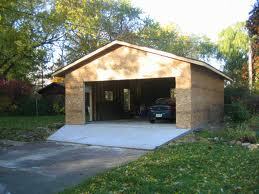 As you can see from the listing of what is included in the typical wood garage kits, and what is not included, you will need to purchase a number of items that are necessary to complete and enclose your prefab garage from the weather and make your prefab garage a finished structure to the degree that you can get a final inspection and use it for the purpose you intend. So be prepared to review closely whatever is being offered in the package, before you make the purchase. Another thing you may want to consider is overhead door size. 8' wide garage doors went out with the 1960s. The 9' width replaced it as the standard width size for a single-car passage opening. Consider whether you want to maneuver a car through an 8' wide opening. It can be done, but 9' is so much easier. If your prefab garage will be a two-car unit, you may want to consider how you plan to elevate the roof trusses up off the ground and into place above the lock-plates of your walls. You may need a small crane or sky-hook truck. Trusses require special bracing while erecting - and they can be dangerous while unsecured. So be cautious! The only advantage that your editor's can see to the wood garage kits for the do-it-yourselfer is when it comes to the roof structure. If your not familiar with computing or cutting rafters for a hip roof or gable roof, these kits may have something to offer you. Otherwise, the stick-built garage is no different in pricing than these wood kits unless you can find a stocking dealer with an over-supply of them on hand who is willing to deal on the pricing.